This story spans a couple of months in the summer of 2013. The nightstand in all its assemble glory…. 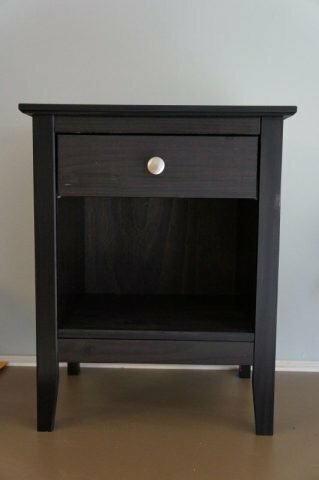 As part of my daughter’s bedroom makeover, we purchased a nightstand at Walmart. I don’t much care for Walmart for sociopolitical reasons, but that’s beside the point. Sometimes there just isn’t much choice when shopping on a budget. In a perfect world, I would have my garage and my workshop and I would have built a nightstand myself. In fact, I still plan to do just that, eventually. For now, though, my daughter needed a nightstand and I didn’t want to spend a lot of money on a “temporary” one. A hundred bucks was my limit. We saw one at Walmart. It was within the budget and my daughter liked it. It would do the job. Later, as I was putting it together, I discovered that it had shipped with two left front legs. Or maybe it was two right front legs. That’s not important. I had an extra piece that I didn’t need and I was missing a piece that I needed. With most pieces of furniture, if there are parts missing, the manufacturer instructs you to call them rather than return the furniture to the store. So I called the number provided and had the first of several pleasant conversations with Janet from Adeptus Furniture in Virginia. At first she suggested I exchange the nightstand at Walmart. I explained that I didn’t know if Walmart had another one in stock. Besides, I had pretty much destroyed the box and would have to take apart what I had already assembled. Besides, most companies just ship out the replacement part. She said that she would see if they had that part at their location. Otherwise, we might have to wait about a month for them to get the part from the factory. About a week later, she called back. They did not have the part locally. However, the owner of the company actually went to Walmart himself and purchased a nightstand so they would have a part to send. At that point I offered to take my chances with Walmart and save them the trouble, but she insisted that they wanted to go to those lengths for me. A few days later she touched base once again with an apology. She explained that the owner had been out of town but assured me that the leg would soon be en route. Another week passed and I received the package. If I remember correctly, they paid close to $20 US to ship the leg. I had only spent $70 CDN for the table. I don’t think they made any money on that deal. Their customer service was nothing short of exceptional. 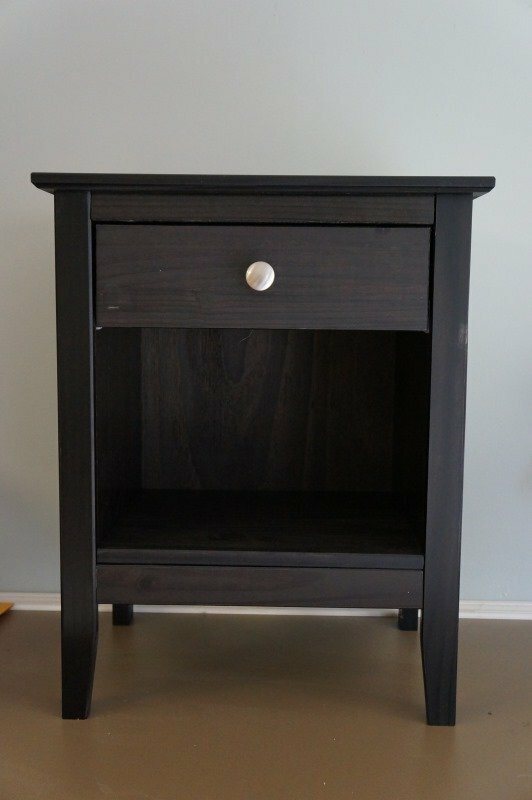 So, about two months after finishing my daughter’s room, I completed the assembly of the nightstand. A few elements of this adventure have altered some of my opinions. Walmart has a reputation for selling cheap, throwaway consumer goods, usually made in China where wages are so low, there is no way we can compete with them here in North America. This particular nightstand, sold under the Hometrends brand name, is imported from South America (also low wages). The solid wood (no particle board) is sourced from environmentally responsible “pine plantations.” For every tree harvested, two are planted. By no means is it heirloom quality, but it is better than most other offerings at its price point. It should last a very long time. So I concede that you can find decent quality goods at Walmart if you look for them. We have seen many of our manufacturing jobs disappear overseas. Even though they can afford to pay reasonable wages here, large companies chose to maximize their profits for the CEO’s and shareholders. So generally speaking, outsourcing is evil. However, the North American workers are not the only ones who are paying the price. Smaller companies that don’t have the volumes or margins of the larger companies are more or less forced to outsource in order to sustain their business. Otherwise they wouldn’t exist at all. It has been my experience that calling an 800 number usually leads to someone in a call center or a cubicle. That wasn’t the case when I called Adeptus. Basically, when I talked to Janet, I was speaking with one-third of the company. And the fact that Janet called back on more than one occasion, well, that was a personal touch that I wasn’t expecting. All in all, despite the frustration of the wrong part preventing me from finishing the assembly of the piece of furniture, dealing with Adeptus was a pleasant experience. And at the end of the day (if I may use that annoying expression) my daughter is happy with her nightstand. And that’s what matter.